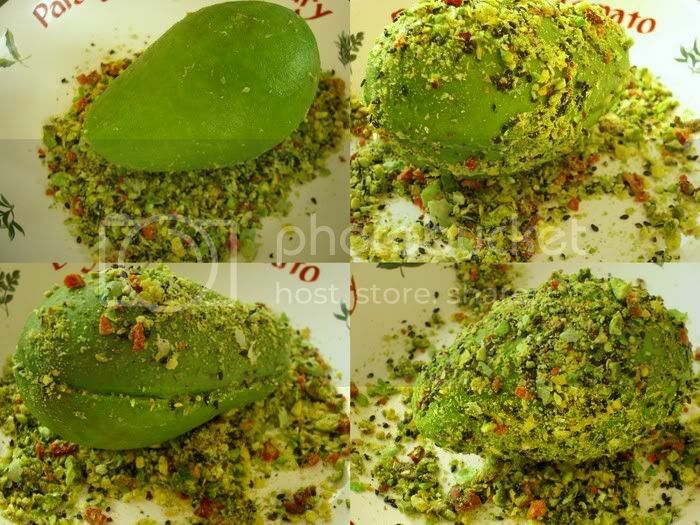 These avocado truffles were once again inspired by Luxirare. The challenge was to use raw ingredients and create some kid appeal. There are lots of ways to involve children in the kitchen. Even as a 20 month old, Paloma is always hanging around when I’m cooking – playing with pots and pans, studying the ingredients, and begging for samples. I can already tell she’ll be a good little chef. When they are able to handle the mess, you can show your kids how to paint pictures with the ingredients, sort all of the components of a dish by colour, or make a game of determining a food blindfolded, just through taste and smell. 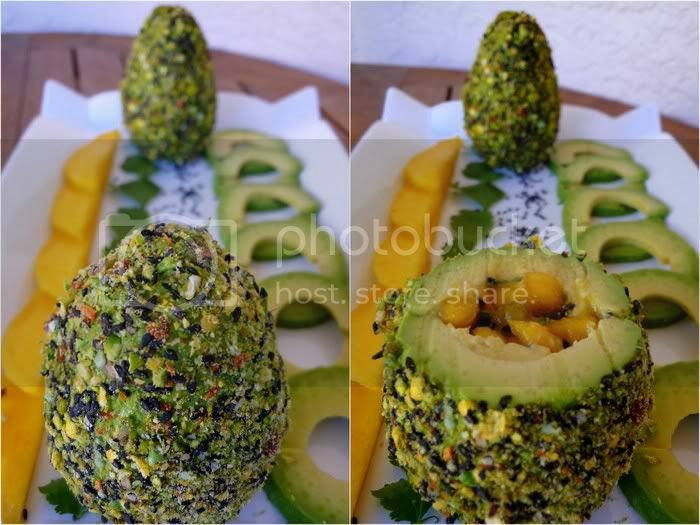 Making these avocado truffles could be a great way of getting your little ones to eat healthy and be adventurous. It is, afterall, a colourful and mysterious salad, with a hidden surprise inside. 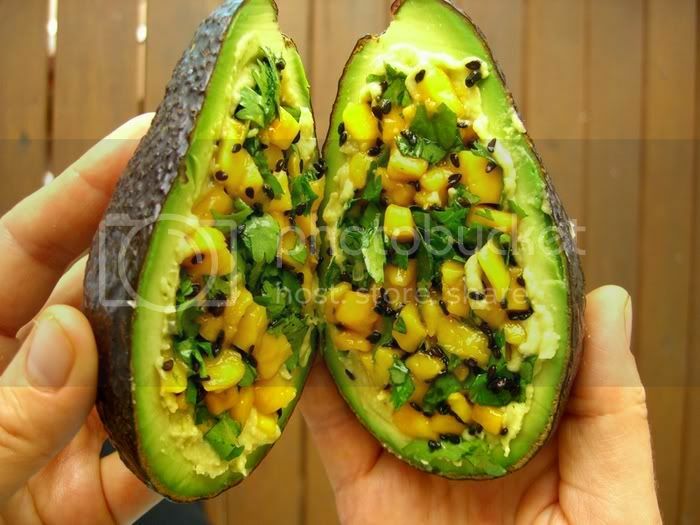 Cut an avocado in half, take out the pit. Scoop out some of the flesh, leaving a good amount intact, so that it holds its shape when you take off the skin. 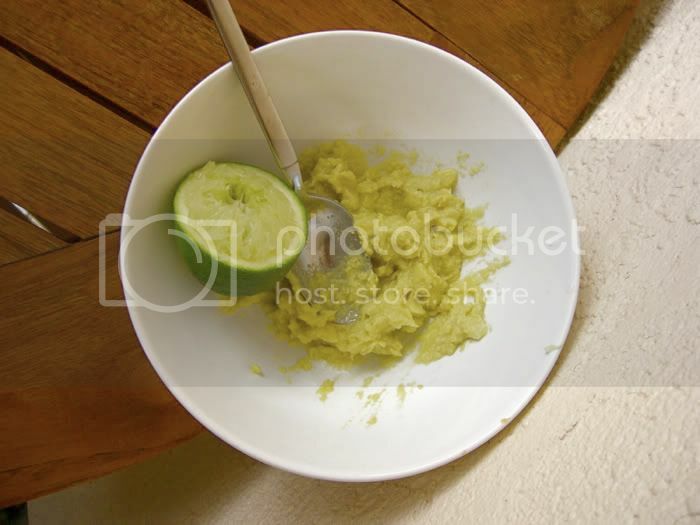 Mash the scooped avocado flesh, adding some squeezed lime juice. 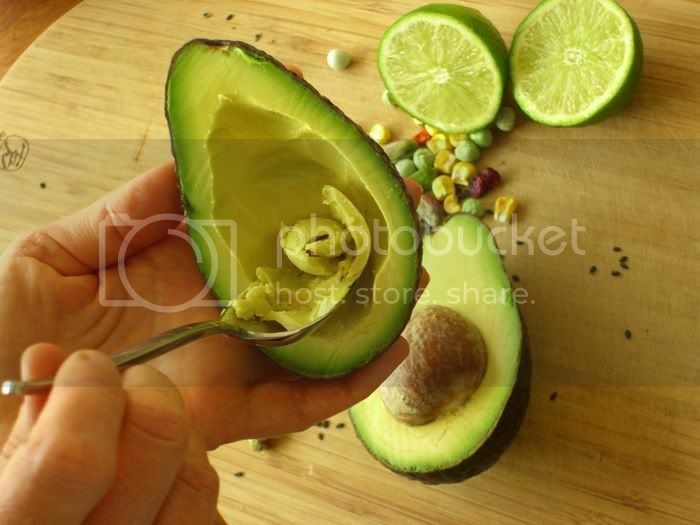 Then put the mashed mass back into the two avocado halves – distribute evenly. There are endless possibilities for the filling. 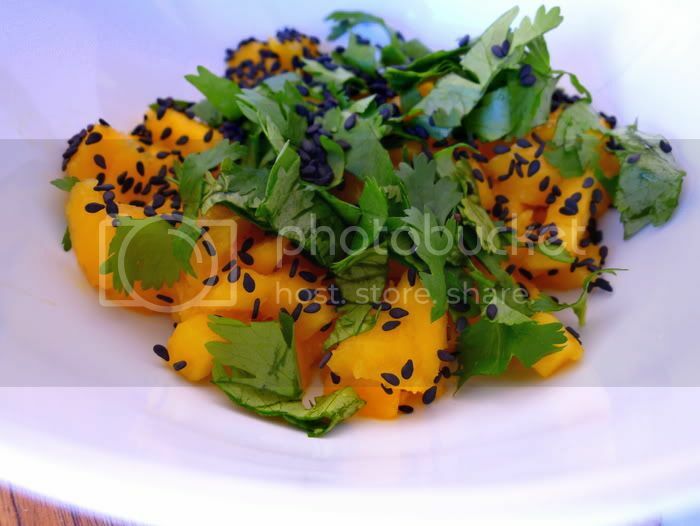 We love the classic combination of mango and avocado, so I made a simple salad of chopped mango, cilantro, black sesame seeds, and lime juice. Put the filling into the two halves. Assemble them back together and carefully peel off the skin. Painting pictures with coating ingredients. Paloma enjoyed pointing out the eyes on the sun. 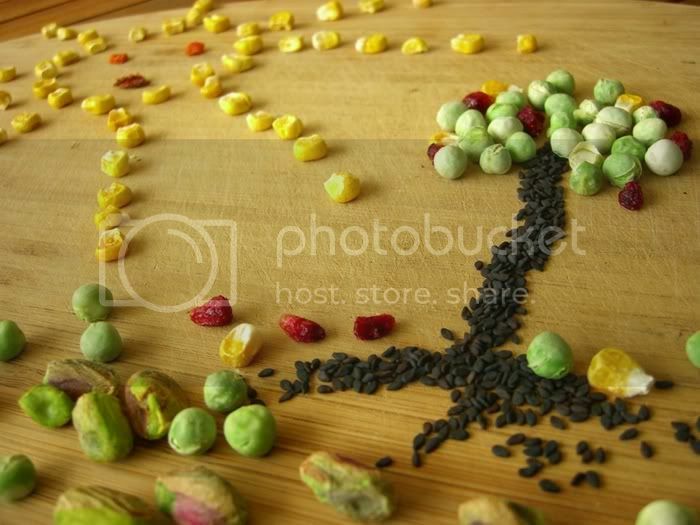 For the coat, I used dried mango, black sesame seeds, pistachio, and freeze dried corn, peas, and red bell pepper. 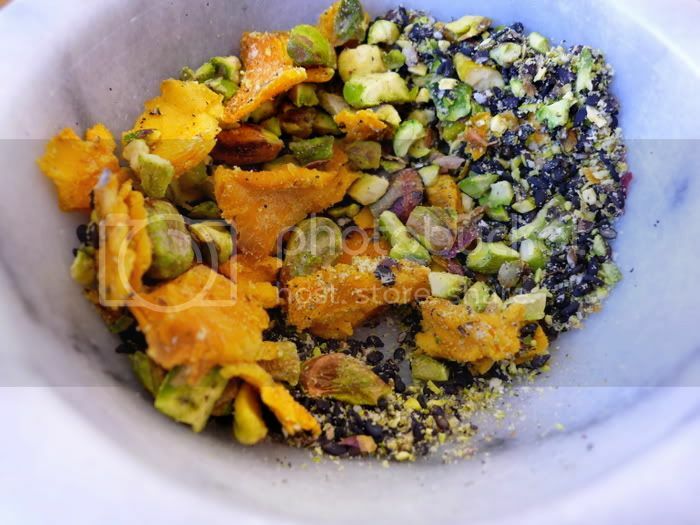 Grind these ingredients together with a mortar and pestle. Bathe the avocado in the ground coating, carefully turning to pick up the crumbles. 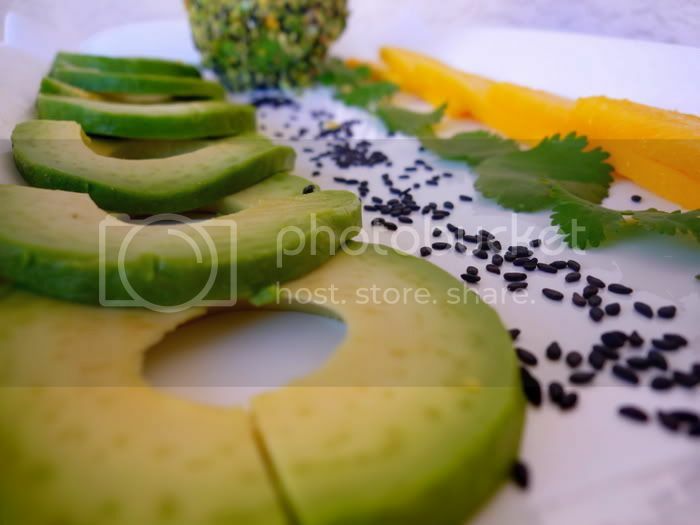 Besides chocolate truffles and truffle mushrooms, the coated avocados reminded us of trimmed cypresses in a jardin à la française, so we went for a linear and symmetrical presentation, involving the main ingredients. Although they look elaborate, avocado truffles are actually very easy and surprisingly quick to prepare. This dish would no doubt be a hit at a dinner party. In addition to being pretty, the truffles are also very tasty, combining the subtlety of avocado, sweetness of mango, a touch of citrus, and finishing off with a pleasant crunchiness of the coat. P.S. Golubka was nominated for Babble’s Best Mom Food Bloggers, we would greatly appreciate your vote! wow, those are gorgeous! Looks delicious too! this is so cool, great ideas for kids! These are some amazing culinary treats…for the eyes and palate! How wonderful of a visual display and demo that kind of brings the dish to life. Colors are so vibrant, ingredients so fresh. looks like you know how to keep your knife edges sharp as well. Is it as labor intensive as it looks? Whatever the demands, I’m sure it’s worth it. Paloma is one lucky little sous chef! Now I see why she looks so healthy and happy! Has she been eating like this from the beginning of her life? How does she handle other types of kids food when around it? Your ideas and photography are truly inspiring. So many wholesome feelings come from them. Anya,,,,,,,,,,with each one of your blogs showing these outstanding photos, and the out-of-this-world dishes; I just shake my head in disbelieve at your amazing, and seemingly never-ending, talent & skills! 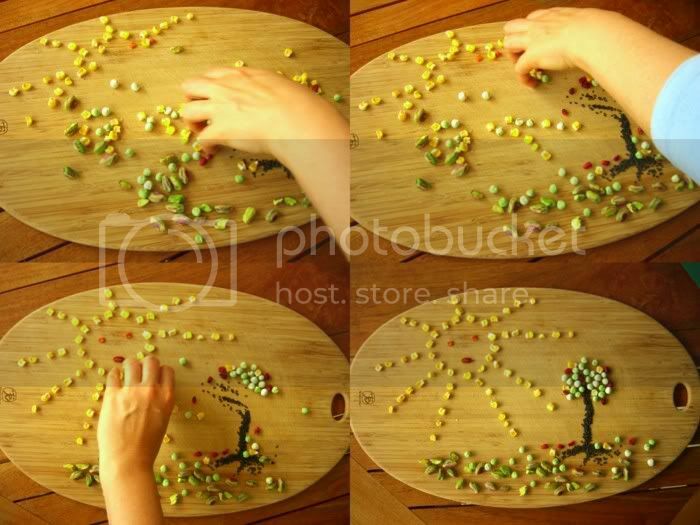 AND,, your art work with the peas, corn & etc,WELL,,,what more can I say!!!!!!! 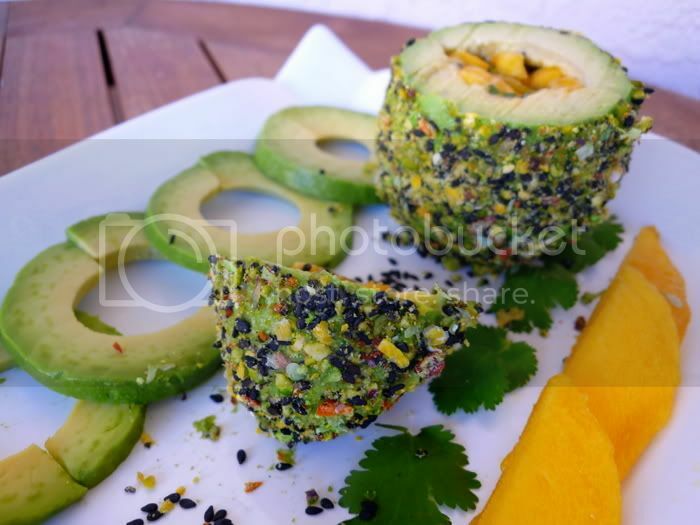 Avocado and mango is my favorite combination!!!!!!!!! This is just absolutely amazing. I love how everything is displayed. I was wondering what some of your staples were – food wise and tool wise. I would love to expand my measly kitchen and talent to create some wonderful dishes like these. Happy Chef: Thanks so much. As I mentioned in the post, it’s not labor intensive at all, quite easy to make. Momma Marie: Awh, thanks so much. Paloma – sous chef, I like it. Hi! I love your blog! i love that you combine fashion + food.. like luxirare but as a vegan i feel your blog is so much more relevant to me! 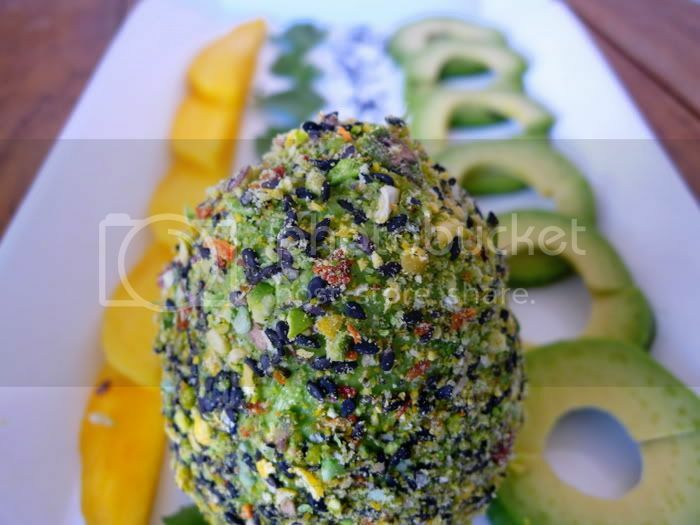 i want to make this avocado truffle.. looks delicious!!! These avocado truffles look incredible — like little veggie-filled treasures. You make whole food look beautiful! CB: Hi, thank you so much! Your page looks great, good luck with blogging! Sheri: Awh, thank you, that truly means so much! i’ve never seen anything so beautiful! this is cyclogenesis: We’re so glad you find it inspiring, thanks very much. Kenzie: Awh, thanks so so much! It’s absolutely amazing and beautiful. Reminds me of Faberge easter eggs… great idea to make for Easter! Thanks a lot! Food that looks this good should be illegal. 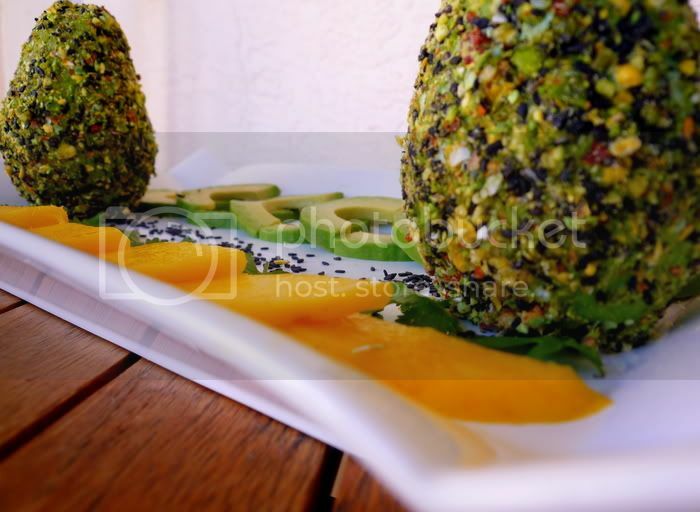 I’m in love with your photography, and your avocado-dressing-up skillz. HOLY GUACAMOL-Y! Great tips on how to make your kids love food and enjoy their time in the kitchen. 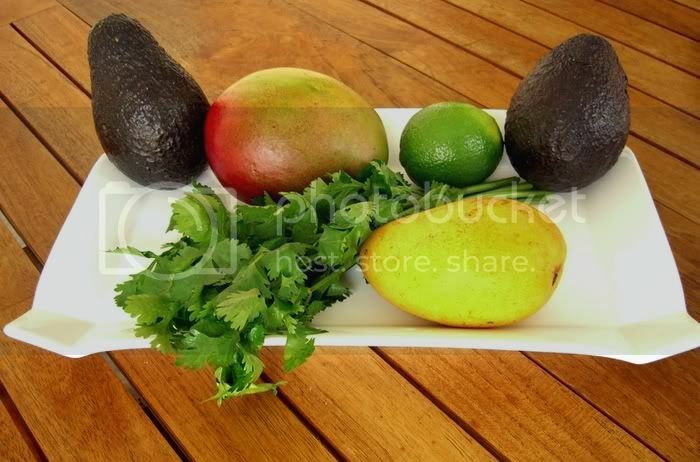 They can adopt good nutrition habits the same way… Avocados are a Brain Booster. B-complex vitamins in avocados support memory and brain function — helping your curious child to grow, learn and play! As the mom of 3 little one’s it is important for me that they get nutritional value in there meals,I am going to try this thank you. This is EASILY the coolest thing I’ve ever seen! By far THE most amazing thing I’ve seen in a loooong time. These would just wow and amaze anyone and they will make an excellent dinner party item. They look awesome for a party. I gotta try making them. What a fun recipe! Love the creativity (and the ingredients are some of my family’s faves)! Wow, I am blown away. have to try!! <3 <3 THANK YOU!! Wow!!!!!!!!!! Stunning. Avocados are my favourite food to eat. Will definitely be trying this one. 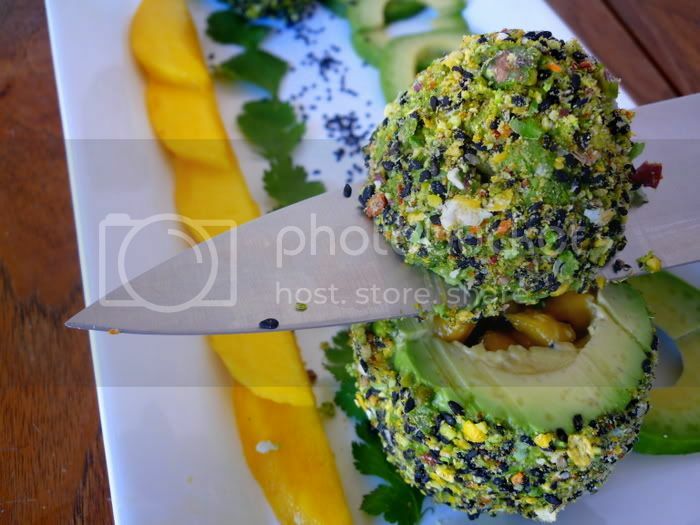 Your avocado truffles look absolutely amazing, I was wondering how you managed to peel the avocado so perfectly? Was just introduced to your blog and just think this post is amazing and will try to recreate. Also, I joined your blog. What is the orange thing in the picture of the coating ingredients? Dried mango? Picture and recipe looks so good! How fun! 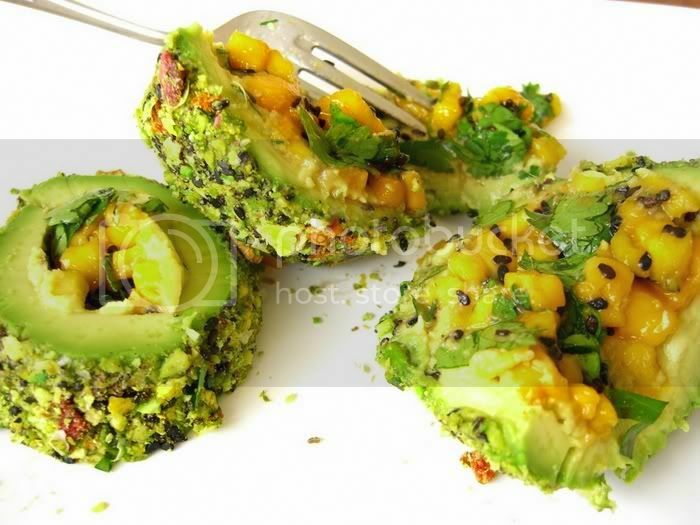 What a terrific idea to get kids and adults alike to enjoy their avocado! Absolutely gorgeous and so creative! I am in love! 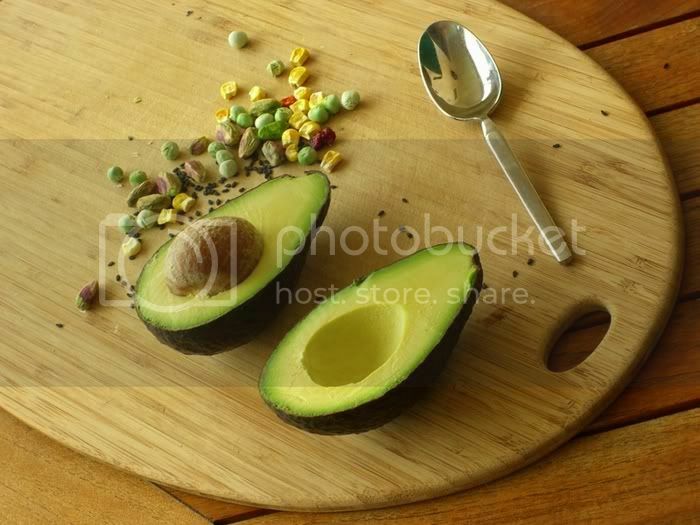 Take a look at the avocado. It looks tasty. Great idea. Anyone know what stores will sell freeze-dried food? Whole Foods? Trader Joes? our southern chains like Publix, etc? Looks yummy! I am going to try this for my party. A printable version would be really nice =\ Or something I can see on my screen all at once without having to be scrolling, looking for ingredients, etc… It looks cool, but I basically have to go through and write down the ingredients and directions for myself. Bah. Wow – what a unique and delicious idea! I can’t wait to try this out! Beautiful pictures too!